This week, we highlight Marvina Thomas of 420 Skincare. Marvina is a compassionate caregiver, mother of two and an expert in her healthcare field. She moved to Arizona over 25 years ago from southern California, where she devoted herself to the nursing field. She’s founder and CEO of Start Living Recovery Home, where they assist individuals to recover from Opioids and Alcohol addiction and she’s spent the past several years self-educating herself on the many health benefits of Cannabis. At Start Living Recovery Home, they assist with job placement which will lead to clients getting back into society, while also educating clients on the benefits of medical Cannabis which leads to them transitioning from opioids to Cannabis has been her successful mission. Marvina is also a strong voice in the AZ cannabis community as Market Leader for Women Grow Phoenix. 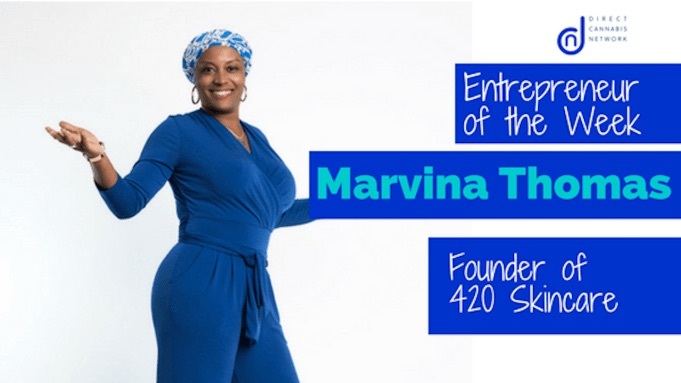 In our interview with Marvina, we asked a variety of questions to learn more about 420 Skincare, what it takes to build a business in the cannabis industry and much more! First off Marvina, congratulations on being featured as this week’s entrepreneur of the week and for all that you do! Can you please share with our readers about 420 Skincare? Marvina Thomas: Of course! In addition to my nonprofit work, I founded Vina’s Soap. I have been making soap products for the past 7 years to raise money in order to financially support the group homes, this soon led to the launch of 420 Skincare. 420 Skincare is a product line which included CBD & THC soap and skin care products for all skin types. Over the past two years of market research, we have been able to see a significant increase in health improvements in those who use these products exclusively. What ignited the spark for you to start to launch your business? Marvina Thomas: My mission is the ministry of health. I’ve been helping the homeless via my start living recovery home LLC and started a Skincare (vina soaps) line to help cover the costs of the soaps I was making for our clients. To this day 50% of the proceeds go directly back into our group homes, that help men and women get off the streets and off deadly alcohol and opioids. Marvina Thomas: By providing healthy natural topicals that are safe for everyone to use. And proving monthly education via Women Grow Signature Networking Events. Who is someone you consider your role model? Where did your organization’s funding/capital come from and how did you go about getting it? Marvina Thomas: My savings, from working hard for the past 25 years. If you could talk to one person from history who would it be and why? With Start Living Recovery Home, Vina’s Soup, 420 Skincare and hosting Women Grow events, how do you stay balanced? Marvina Thomas: My husband is my rock and keeps me grounded. Marvina Thomas: Have realistic goals. You have to give to receive. Be prepared to put a lot of time & energy & financial investment into your startup. Marvina Thomas: The hardest part is there is not enough time in the day. Marvina Thomas: At the end of the day this started as a black market industry, so be prepared to run into a few questionable characters. Do your due diligence, and research potential colleges before investing time or money. Marvina Thomas: Learning who to trust has been one of the hardest lessons I’ve learned so far. I proceed with caution now. Marvina Thomas: Nirvana Dispensary, Green Pharms, Nirvana & the Good Dispensary in Az. Thank you, Marvina, for sharing your story and offering such real and insightful advice! It was so great being able to feature you as this week’s entrepreneur of the week!